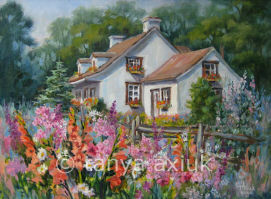 Born in Ukraine Tanya Axiuk settled in Quebec in 1951. 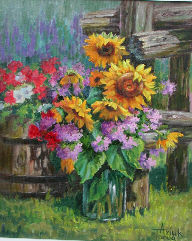 This renowned artist studied design in visual art, drawing, and sculpture. 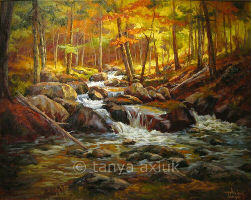 She has exhibited solo in Montreal, Toronto and Ottawa as well as in numerous galleries across Canada. 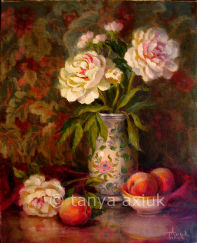 Throughout her 40 years as a professional artist, Tanya Axiuk has won numerous awards. 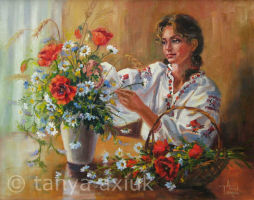 Although her subjects are varied, she is known for her oil paintings representative of flowers and gardens, beautiful still life, landscapes and enchanting Ukrainian themes. 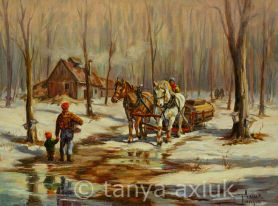 Her paintings are part of different private and corporate collections across Canada, the United States and Europe.